Take advantage of a VPN service to watch Gotham from anywhere in the world. Before Batman kept the city safe, Gotham was riddled with crime, corruption, and villains. So it’s up to Detective James Gordon to pick up the slack. If you want to watch the upcoming season of Gotham without cable, a subscription to a streaming service, or even if you’re outside of the US, you’re in luck. We’ll show you how! The key to being able to watch Gotham online for free is to use a VPN. Using a VPN will protect you from online security threats such as hackers and cybercriminals by encrypting your data, but it will also maintain your online anonymity and privacy. However, in this case, the most important feature of a VPN is to bypass geo-restrictions, allowing you to change your IP address to make your device appear as if it’s in a different country. 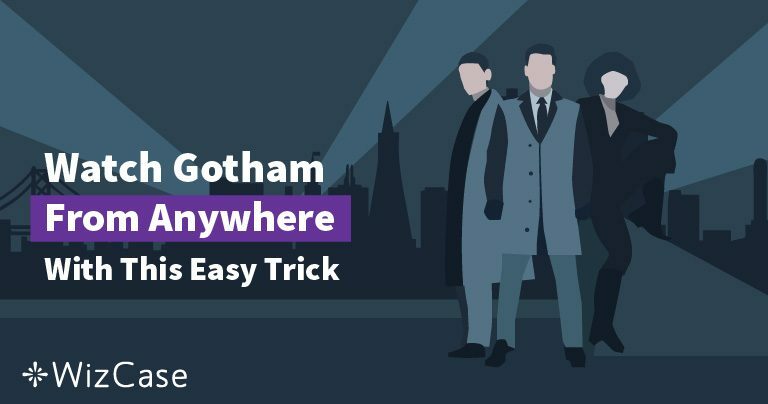 In this article, we’ll explain how to watch Gotham online, as well as show you the top 3 VPNs you can use to get the most out of your viewing experience. Gotham’s fifth and final season is here! Episode 1 aired on January 3rd, 2019 and each episode after that will follow every week. Gotham will be shown on FOX, but if you don’t have a cable subscription it will be available on FOX.com. Choose a premium VPN service with servers in the US. Connect to a dedicated server in the US. Stream season 5 of Gotham. Fortunately, to watch Gotham on FOX, you aren’t required to sign up or purchase a subscription. Therefore, you can watch the new season completely free. 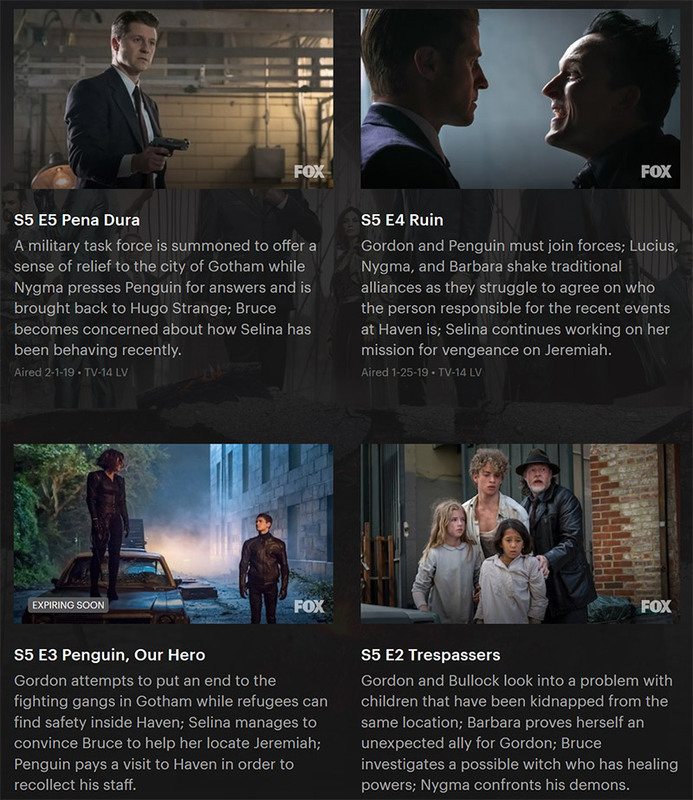 It is important to note that each week, the new episode of Gotham will become available on FOX.com the following morning after it has aired. There are many VPNs on the market, but not all of them will provide you with an exceptional service, tailored to streaming. First of all, we recommend you select a paid for premium VPN provider to ensure a smooth uninterrupted viewing experience. 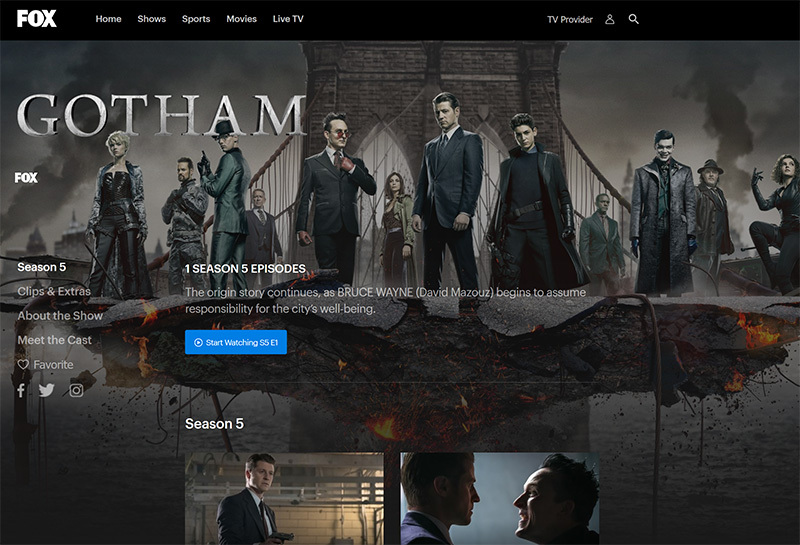 When choosing our top VPNs to watch Gotham online, we focused on their streaming capabilities as well as speed and performance, and server coverage. As one of the fastest VPNs in the world, ExpressVPN in unrivaled in its performance for streaming. Over long and short distances, connections remain strong and speeds aren’t sacrificed for other features. Furthermore, ExpressVPN’s no throttling policy means you can stream Gotham from outside of the US and it won’t feel like you’re using a VPN at all. ExpressVPN has a huge library of available servers in 148 locations in 94 countries – 32 of these locations are in the US, so you will have no issues connecting to a server and watching Gotham uninterrupted. Finally, if by some small chance, you’re unhappy with the service, you can utilize their 30-day money-back guarantee and cancel your subscription free of charge. Not only is NordVPN one of the safest VPNs available, but it is also one of the fastest. This VPN offers its innovative Smart Play technology, which optimizes its servers specifically for streaming. As a result, you’ll experience zero interruptions and no buffering when watching Gotham. Connecting to a server in the US will not be an issue, as there are 1,863 to choose from, out of a total of 5,084 across the globe. When you choose to connect to the US, NordVPN will automatically connect you to a server where your connection will be the strongest. Not only will you have the ability to watch Gotham online through NordVPN, but so will your family and friends. On one account, there is a 6 device limit, meaning you and 5 others can utilize the full potential of NordVPN at the same time. If you want, you could watch Gotham on your laptop, desktop, tablet, phone, and smart TV at the same time, at any time. Last but not least, CyberGhost VPN is a great service that can easily bypass geo-restrictions and allow you to watch Gotham online for free. While they are constantly adding new servers to their library, CyberGhost currently has over 3,000 servers worldwide with 561 of them in the US. The CyberGhost app is very easy to use and simple to navigate. This VPN is perfect for those who aren’t too familiar with VPNs but want a great service everyone can use. There is also a dedicated streaming section that changes the settings to enhance the streaming experience. Along with the unlimited bandwidth offer, CyberGhost is one of the fastest VPNs on the market when it comes to streaming. If you don’t want to fully commit to the service, you can start a 7-day free trial to see if you like it before committing. What’s more, you can cancel your subscription within 30 days should you want your money back. The best place to watch the first four seasons of Gotham is on Netflix. If the show isn’t available on Netflix in your country then you could connect to the UK or US service and access their Netflix library. Since Netflix has strict restrictions regarding the use of a VPN, you may have issues connecting. However, if you use one of the VPNs from this list, you’ll be able to connect to either the UK or US Netflix without hassle. So regardless of where you are in the world, you can watch Gotham online at any time, in any location. Regardless of which VPN you choose, we can guarantee that you will not only be safe and anonymous, but you will also be able to watch old and new episodes of Gotham with ease. If you follow the steps listed above, or take advantage of one of our chosen VPNs you’ll be transported to the city of Gotham in no time.